MINNEAPOLIS - After his Bears finished with a 3-13 record last January, Alshon Jeffery proudly guaranteed a Super Bowl win the next year. Throughout this season, Jeffery made sure to clarify that he never specified a team. On Sunday night, his guarantee came to fruition, but he's not one to say "I told you so." OK, so maybe he is. "Man, what I told y'all?" Jeffery said, breaking into a grin by his locker after the Eagles' 41-33 win over the Patriots in Super Bowl LII at U.S. Bank Stadium (see breakdown). "Before the season, I said I guaranteed that we were going to win the Super Bowl. I never said a team. "Whatever team I joined, we won the Super Bowl. And I said it earlier this week, we were bringing that trophy back to Philly. Speak it into existence. That's hard work and dedication." This offseason, the 27-year-old receiver left the city that drafted him and the city where he had spent the last five years of his life. Jeffery came to Philadelphia because he said the Eagles wanted him more; he felt it. As soon as he landed, he said it felt like home. That's why he didn't bother waiting for another crack at free agency when he signed an extension during the season. And it's why he never had any doubt about making his guarantee a reality. "Nah, man. I believe in us, man," Jeffery said. "I said it all along. Ain't nobody f------ with us. The only ones that could stop us is us. We went out there and proved it. We world champs." Throughout the week, amid the craziness that follows the Super Bowl, Jeffery was incredibly locked in. He said time and time again that he was in Minnesota only for one thing and it wasn't fun. All he cared about was the win. And he helped make it happen. Jeffery caught three passes for 73 yards, including a 34-yard touchdown from Nick Foles in the first quarter (see Roob's observations). 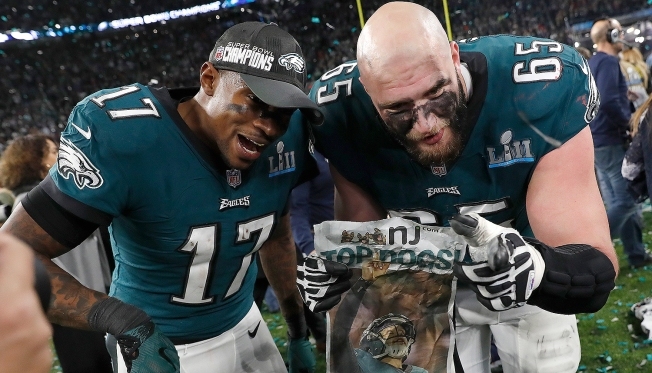 Like they had been in their previous two playoff games, the Eagles were underdogs in the Super Bowl. Of course they were (see story). They lost Carson Wentz, Jason Peters, Jordan Hicks, Darren Sproles, Chris Maragos and more. Jeffery never thought about turning back on his prediction. "Just keep doubting us," Jeffery said. "Y'all doubting us now? I bet Vegas doubted us, too, huh? Hey, we are world champs. We are top dogs. We aren't underdogs. We are the top dogs." Not long after Jeffery returned from celebrating with his teammates under the floating green confetti (see celebration), he said the Eagles are trying to start their own dynasty (see story). Jeffery is under contract through 2021. Most of the team comes back for the 2018 season. So is he ready to make another guarantee for next year? "We are going to enjoy this one, man," Jeffery said. "We are going to enjoy this one."